Let's just say that this weekend is all about those California based companies that feel strongly about a high quality, all natural product. Life Flower utilizes therapeutic grade essential oils in conjunction with CBD oil to create skin care and body health products that relax and rejuvenate. Cate Be is where this came from. Cate Be is one of my favorite humans on the Earth and I have not even met her. Strange I know. But hear me out. Watching her practice self care, create beauty, enjoy nature and find laughter in the little things brings me joy. It makes me laugh out loud that there are people with happiness, wit and a no-nonsense approach to life out there and I watch it unfold right before my eyes in her IG stories. I laugh! With joy! She has helped me to embrace my femininity in places I have been scared to look. She has made me curious about natural healing. She really is pretty darn cool. And she totally enabled me on these bath bombs. 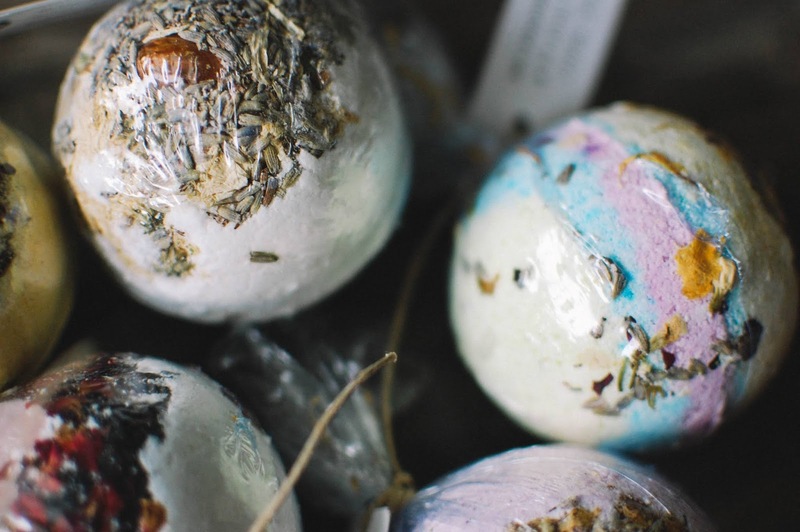 I went for the bundle of bath bombs that include five best sellers for $60. They sell for $15 each so the bundle is getting one free. I also added one more to my bundle. 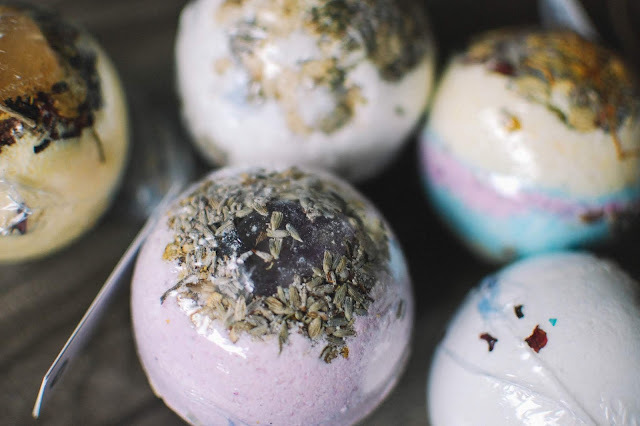 These bath bombs all include 50mg of CBD oil. Most have a crystal embedded. The best part is that they are rich with essential oils and smell fantastic. I also quite enjoy the botanical bits. 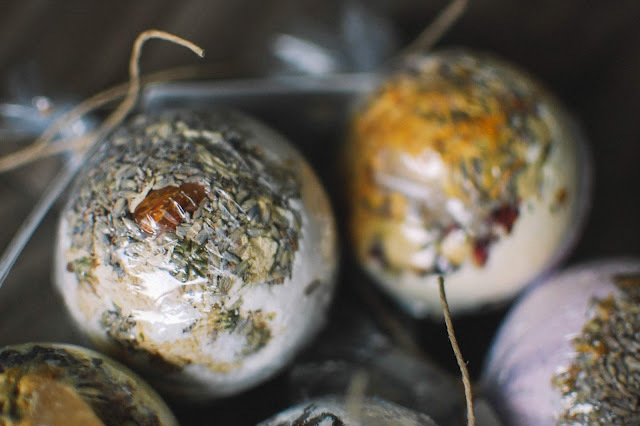 When I use these fizzing masters they impart a rich and luxurious scent to the bath and leave a layer of oils on the surface of the water that then cling to the skin and feel emollient and nourishing. I don't use lotion after I bath with these bad boys. The scent lingers and it really is a chill experience. I picked these up when there was a 20% off coupon code. Flower Child brims with peppermint, eucalyptus and rosemary oils and holds a quartz crystal within. I have not used this one yet as I have an inkling it might be favorite of the bunch based on the oils. Save the best for last and all that. Crystal Visions features geranium and other floral essential oils as well as a smoky quartz. I used this one and I picked up lavender in this bath bomb once it hit the water. It smelled like a lavender and geranium dream. White flower blossoms (mums it looked like) and lavender buds floated all about like a garden pond. I would happily get this one again. Limonene is a vibrant blend of lemon, tea tree and lemongrass essential oils that embraces a citrine point. Rose petals and jasmine buds make a nest for the stone. Savanna picked up on the lemongrass as soon as she walked into my bedroom when I used this one. It is potent and very sunny. Very lemony. I loved it. The citrine in it is pretty too. Aphrodite features rosemary and other essential oils. Rose petals and a rose quartz make the perfect accompaniment to this lusty bath bomb that is purported to be an aphrodisiac. This one is tucked away for later enjoyment. Sativa is a breathtaking blend of sage, peppermint and eucalyptus essential oils with lemongrass and sage and eucalyptus botanicals loaded on top. I use this one up first and it was bliss. The peppermint and eucalyptus opened up my senses and immediately calmed my mind. The velvety sage was deep and mossy. I will be buying this one again without a doubt. This one was part of the bundle. *Edit. I did buy it again. The one bath bomb I bought separately was Hypnosis, a lavender centric bath bomb meant to induce sleepiness and relaxation. Savanna immediately claimed the amethyst once I get around to using this beauty. I am saving this one or my next bought of painful PMS. Ok. So I totally enabled myself when writing this. I went ahead and bought another bundle. Yep. Sure did. Without a coupon code. 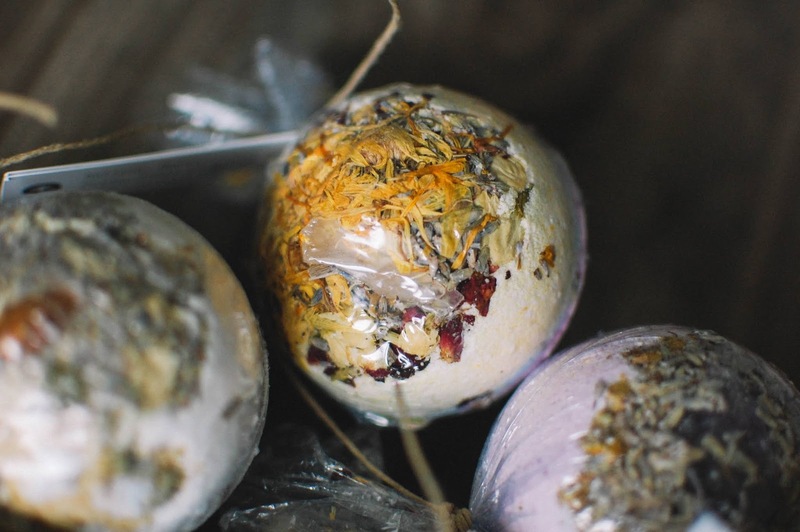 I loved these bath bombs so much I started breaking into them before I could even take pictures of all of them! Seriously. These are spellbinding. 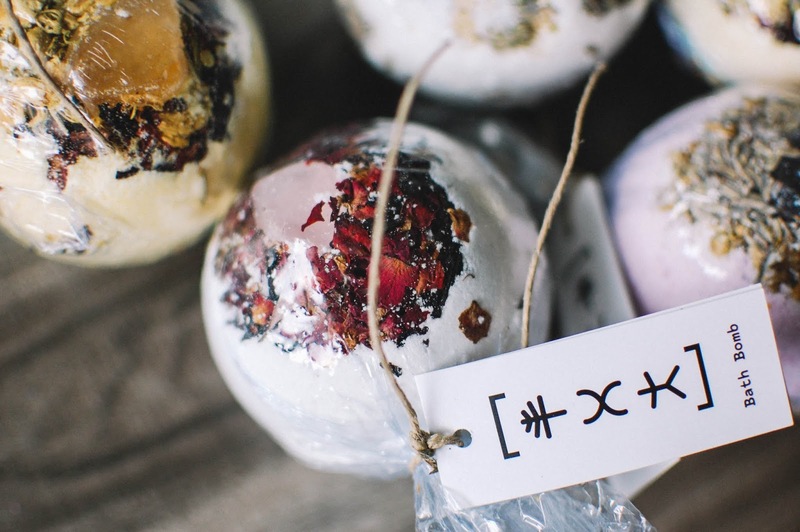 Do you have any favorite all natural bath bombs? Are you using CBD for pain or anxiety? Talk to me about your bathing ritual. Mine happens at night. Includes a few candles and a fat book and something smelly in the tub with the hottest water I can get. Low lights. Pure nirvana. Wow, you sure do dig CateBe, one of the loveliest story makers:) I've noticed a few more crystals popping up in your photos. I only have the rose quartz, sent by Cate<3 and one other orb, obsidian I think, which I want to include in photos, but I keep forgetting to look for a tiny stand to pop it on. The botanicals are beautiful, in my opinion, much nicer than those neon colored fizz bombs. I would choose to float in this garden pond before I would a psychedelic pool (if I was much of a floater). 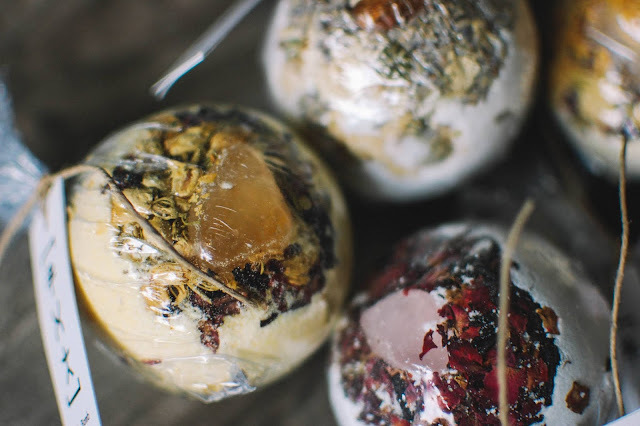 These are tempting for the botanical, crystal elements alone and some of those scents sound splendid. Makes me wish for a larger, garden tub. Enjoy the relaxation. I do. I am a geeky fan girl. Between the bath bombs and the crystals that come with mugs I am amassing quite the collection much to Savanna's delight. Santa brought her a rock crystal collection one year for Christmas. I would love to see you obsidian! I totally agree with you. I would much rather bath with a flotilla of flowers than an ounce of glitter. My second order just came today so I am excited to enjoy a bath tonight after a few days of non-stop going. I am ready to relax and kick up my feet for a bit.